Lots of fun connecting up the dots and ensuring the flow works well. I have taken a back seat from constant meet ups and hack weekends the past few years - I started The London Web a group which has 4800 members and counting… Kids are now the priority without grandparents around for us in London - getting out to London when you’re based close to the school run can prove quite difficult to co-ordinate. I am fortunate enough to have combined my Christian faith with my passion for code and web application development - for the past 3 years I’ve been building and maintaining Lepton - a church giving app. I’ve been doing web development for 20 years, but only just 3 years ago got the chance to do this for the thing that I’m most passionate about - my faith and love of Christ and his church. Many have this perception that it is the clergy - the church leaders, that have the main role to play - that’s not quite true. As christian developers and technology professionals, I believe we play the most important background scene in this technology based world. For most churches, their IT department is under-utilised, a bit of a mess to be frank - IT contractors are expensive, and IT is a bit ‘ad-hoc’. We have a major role to play over the next few years to ensure the church “Gets with the times”..
Join me and other christians in tech - and we’ll change this - co-ordinate visions, work out our passions, our interests, and apply them to our faith..
= Voice Recognition Slide Transitions = iBeacons for the homeless - give to them without risk of them using your money for alcohol and drugs. = Refuge Homes - a registry of the places UK refuges can be accommodated by our communities = Prayer app collaborations = just a few to spark your interest. This year I’m planning on hitting the ground full force with coding tools I am totally familiar with - last year I tackled Django for just the second time and it was a bit much - this year the code will be cranked out with passion through the night - and I’ll still probably get more sleep than when my kids are around! Search “Code for the Kingdom” and get your tickets - it’s a global event with 16 cities taking part on one weekend ! It’s on the 21st to the 23rd of October 2016 - it’s going to be awesome! As a group of Christians in tech, about 10 of us have been meeting for a number of months to plan a Hack Weekend in combination with 13 other cities around the world. It's called Code For The Kingdom, and the London base will be on the 2nd of October 2015 starting Friday evening and ending Sunday afternoon. We are quite silo'd as a community of Christian techies, and even in a larger church such as HTB there are surprisingly few of us. This is about meeting others with the same visions and faith as ourselves. Getting time to do "what we want to" relating to Christian initiatives isn't easy - I have kids, who consume most of my time, and generally time that I do have is keeping up with the latest trends and technologies without actually building anything. Here's a chance to change that. We occasionally need others to come alongside us in our daily work requirements. What better way to work out if you can stand someone, than to code through the night with them? "Send me, therefore, a man skilled to work in gold and silver, bronze and iron, and in purple, crimson and blue yarn, and experienced in the art of engraving, to work in Judah and Jerusalem with my skilled workers, whom my father David provided." Although it didn't mention "programming" or "IT" in the building of the temple, I have no doubt that Jesus calls us all to be professionals and use our skills and gifts for His glory. What better way to start this than joining us on 2 October. Sign up here! I recently found my system crashing after about an hour, this would happen without doing anything in particular. I did some investigation, cleaned up drives, etc, then found out it was my 512GB SSD that I bought over two years ago - it needed a firmware upgrade. So I followed the information in the above link, only to find it didn't work for the mac. After a lot of hunting I found this article which pointed to this older article that wasn't needing translation. I followed the tutorial, and took the advice to section off a bit of my extra hard drive (the non SSD 750GB drive in the DVD Rom enclosure), and tried to boot off it - it wouldn't boot. So now that I had the correct disk image copied from my flash rom drive on a 5GB partition on my 750GB drive, I found I needed to download the newer rEFIND Boot Manager , specifically the USB flash drive image file, and followed the instructions to install it on the 16GB Flash ROM drive. I plugged the 16GB Flash ROM drive in, restarted while holding down the option key, and it asked me to select my usual options but also a orange drive that was the rEFIND Boot Manager that was on the Flash ROM Drive. Once selected it asked me if I wanted to use the SYSLINUX partition that I had made by following the article above. From there I followed the instructions to install the firmware upgrade. I've created a calendar for my availability for "Symfony 2 PHP Development", best practice training, and web development support for 2013. If you know me, you already know that I've been doing web development for 16 years, so can take on all manner of projects, but I'd prefer them to be built with Symfony 2 and jQuery. The calendar will be booked up on a first come, first accepted basis. Generally I'll require a £100 deposit, but this can be negotiated based on connections. I'll be in contact about all bookings, so be sure to leave your contact details when you book in! I can be on-site in London for the full 8 hour day. Please contact me @nathanlon on all social platforms for further details. with the abstract defined higher up - set with abstract: true, and the calls on these. You can override the calls parameter on the service that extends a parent, by adding calls to this too, and using the same key. Note that it is then called twice, so if you want to add to an array you can (otherwise it gets replaced with the last call). You could remove parent param from extender to stop this. then use factory_service: yml line referencing the factory key. For the method used within this factory, define it as factory_method: , e.g. get. For arguments you wish to pass into the get method, use arguments: - an array - @templating for example. 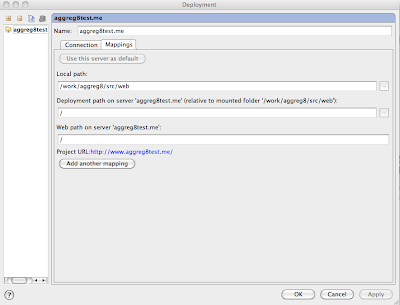 Services can have tags, which implies that the service is to be used for a specific purpose. 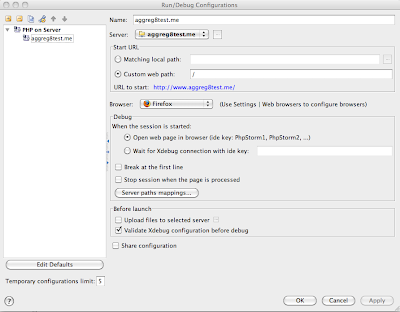 I wanted to get XDebug working with my new IDE of choice: PHPStorm. 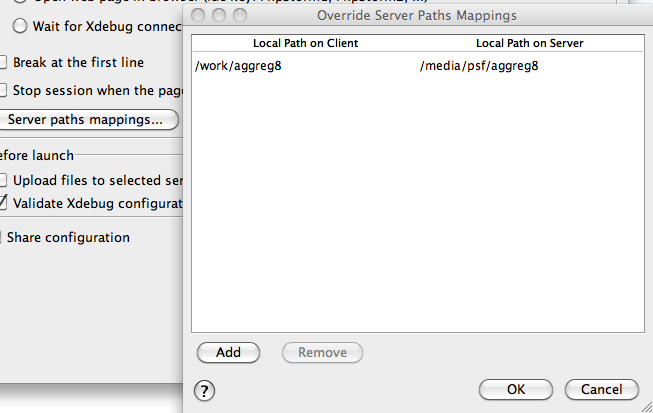 I'm running a Parallels Virtual Machine (VM) with Ubuntu on it, and sharing my local folder on my Mac running Leopard. 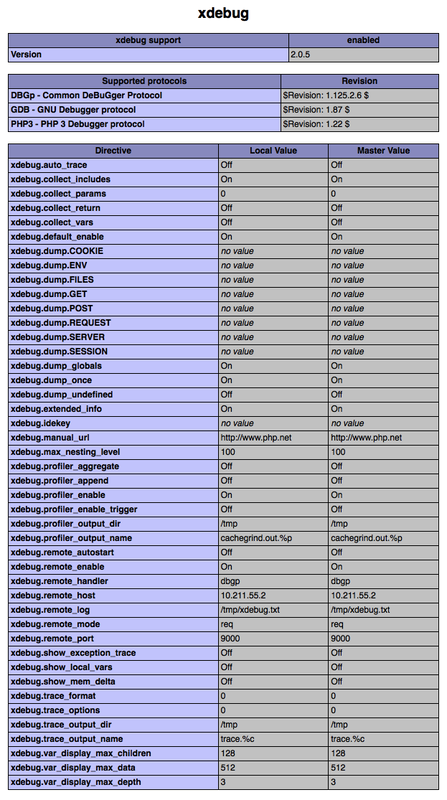 I already had PHP 5.3.2, Apache 2.0 and mySQL running on the VM. This added a file named: "/usr/lib/php5/20090626+lfs/xdebug.so"
I also checked there was no zend lines referring to zend debuggers etc, which conflict. Above, I made sure to use the mount point that the VM was using - this was configured using Parallels > Virtual Machine > Configure > Shared Folders options tab previously when setting up my VM. 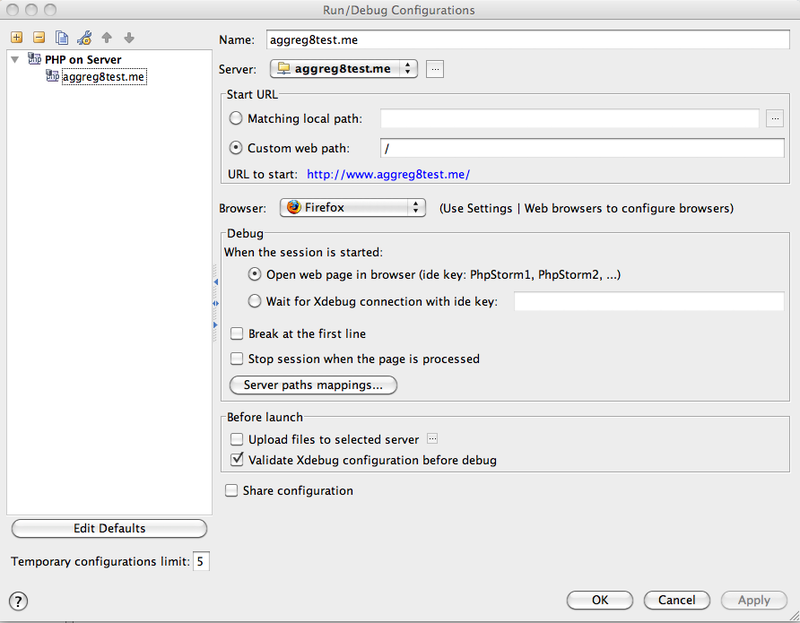 Now to debug, I could click the Run > Debug option in PHPStorm. I hope this helps someone. Any questions, please email nathan [ at ] eit dot co dot nz. Calum Ryan ( @zizzfusion ) is offering a free pizza voucher prize - and although I love pizza, I'm always interested in commenting or helping on any website designs that people ask for feedback about. - easy to see fresh articles from the homepage - with comment count as bubbles. - screen shot popup - love these things. - the positioning of the popup about this competition - overlays the logo - could do with a cookie check to see it doesn't show again when refresh the homepage, but ideally slide it in, and position it so it doesn't look like an overlay banner advert. - when viewing on 1024*768 there is no margin and slightly to wide, so the nice circle to the right is cut off and a unnecessary scroll bar appears. - portfolio page calls "articles" "tutorials"
- screen shot popup needs a close button at the top. - could enhance the portrait picture on the portfolio page as it's very dark. - description in meta tags could be stuffed with more keywords like "design, webdesign, london etc.. - not exceeding 156 characters of course. With a few tweaks this could be a great website! My Dream Car - only it's black. Lately I've been doing a lot with the eBay APIs and more specifically the trading APIs for listing items. (I've also used selling apis a lot in the past when working with the ebay deals placements while at eBay). Some of the quickest results can be acheived with the use of pre-entered products found using isbn, ean or reference numbers. The trick when comparing with existing competitor items and trying to re-find these numbers, is to find the item using individual trading api calls and your token, as the shopping APIs don't often give quite enough detail about things like Ean numbers. I have recently purchased a macbook pro and wanted to set up my web development environment on it. A lot of people seem to download MAMP, but I have (so far) being able to avoid this. to shell in as root and not have to write sudo everywhere. I wanted to be able to run PHP from the command line, so I added the necessary modifications to local environment variables using setvar - look this one up. 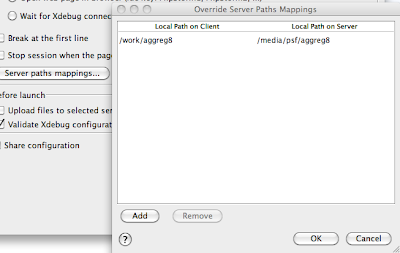 Pear is now under /usr/local/bin/pear - this will be handy to know when specifying the location of symfony later. I modified the existing /etc/php.ini file (if this doesn't exist, make a file named ~/Sites/phpinfo.php with within it, and go to http://localhost/phpinfo.php in your web browser. It should show you where php.ini is located. 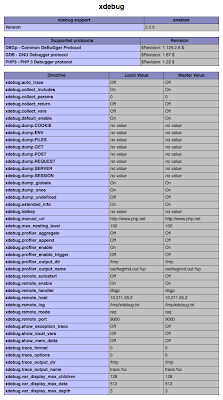 (ignore all the pdo_mysql.dll modules as they are for a PC). And PDO support should display with mysql listed within it. would not work and, it seems this was because of a fault with versioning of PDO. So to fix all of this I decided upon Mac Ports, which required the Developer Tools on the OS X Leopard installation CD. 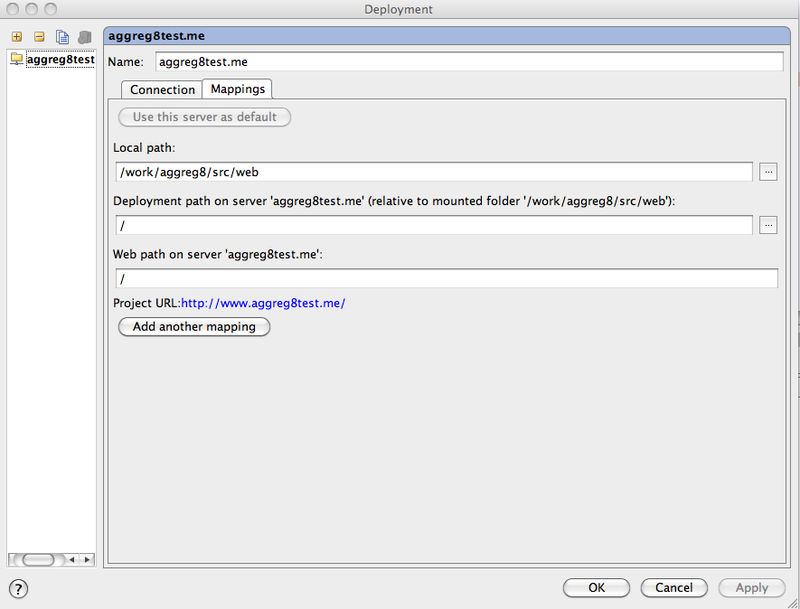 After installing this, I went to macports.org and downloaded the tar package and installed it. The above command took quite a while, basically copy the tutorial referenced above. UK Ubuntu 8 MythTV install with Nova-S-Plus satellite card and a working satellite dish pointed at Astra. This suggests partitioning with certain file systems - this may be better than a "standard wipe everything" approach. If you have a new motherboard, make sure you plug in the sound plug from the front of the case, and ensure any on-board audio is enabled in the bios. change the password for root, so you can use "su -" and not have to use sudo. do the update it requests in gui. This should generate a list of channels in /root/.szap/channels.conf, this will take a while, let it run to the end. get out of root, and back to the logged in user account (eg: named username) you were in before using su -. don't bother entering a password for mysql. use all the defaults when installing. Say yes, when asked if using other computers to run with MythTV. don't make a password for the mysql root user, but I did, so read up about problems you may have when you set it. instructs that to run backend, use: "sudo /etc/init.d/mythtv-backend start"
says to use: "sudo dpkg-reconfigure mythtv-common" if wanting other machine to use existing mythtv-network. - should ask you if you are ok with setting the user in the mythtv group. These should mostly be left at the default settings, although you may need to change (or create with appropriate permissions) the directories to hold recordings and hold the Live-TV buffers. For the UK, TV format should be PAL, VBI format should be PAL Teletext and the Channel frequency table should be europe-west. On the page marked "Job Queue (Host-Specific) I turn off "Allow Commercial Detection jobs" since I haven't found that the commercial detection works very well, and the mythcommflag processes are running more or less all the time. mythfilldatabase - you may be asked to do this anyway. Get the "Platform Runtime Binary", you don't need one of the others as it just includes things you probably won't be using. Download the attached bookmarks.xml from this thread. Extract the Eclipse Platform Runtime archive to a folder and run the Eclipse binary in the folder. There is no installer to run. 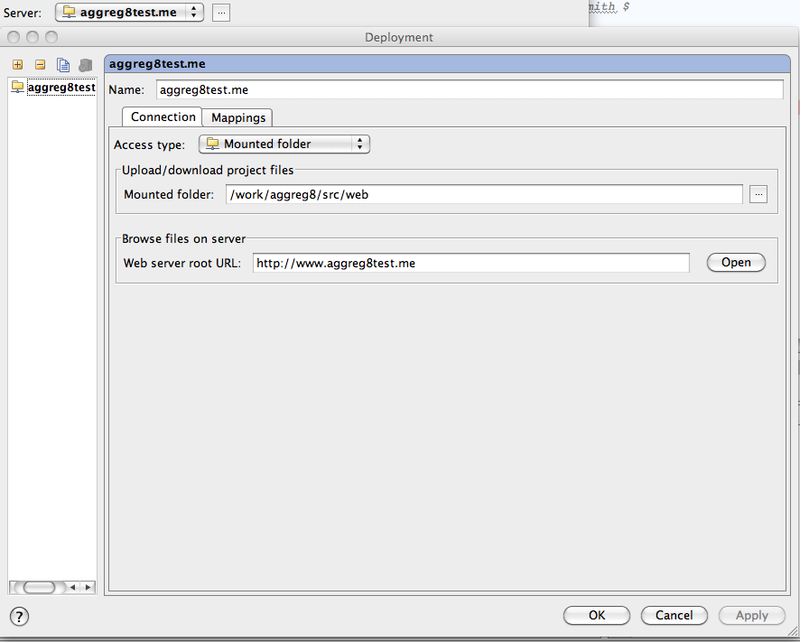 Click the "Import Sites" button on the right side and choose the bookmarks.xml file you downloaded. Check all the boxes in the list and click Finish at the bottom. When it comes up with the list start at the bottom and open up each arrow. You only need to open the first arrow for each item. This is required for the "Select Required" to work. Now check the first box for "Zend Update Site" and click "Select Required" on the right. Once it is finished and everything is checked, uncheck the "Zend Update Site" box. Drill down into Spket and choose only Spket IDE. Uncheck the outer checkboxes for "Subversive update site 0.7.x" and "Subversive update site 2.0.x". 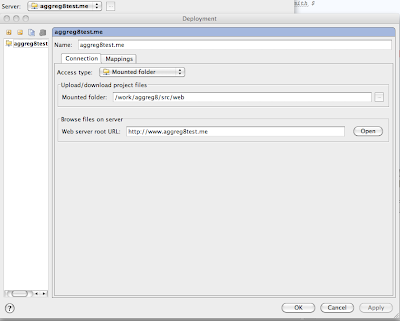 Check the outer box for Symfoclipse. Drill down into Subclipse and choose only Subclipse. Drill down into Target Management Updates-> TM and RSE 2.0.2 and choose the protocols you want to have for Remote System Explorer. If there are any unresolved dependencies at this point click "Select Required" again. Finally click finish and have it install all the stuff. When you're done you should be able to follow the directions in the symfony wiki for including symfony in PDT to get the code completion working. You'll also want to cleanup the update site list and remove all the duplicates as installing features adds new update sites to the list.